The most popular cake in The Cake Bible is the Chocolate Domingo, and after 30 years it’s time to reveal how it got its name! The Chocolate Domingo is also our Recipe of the Month for January posting January 5th. Fortunately I realized that the correct procedure would be to ask Pavarotti’s permission and also fortunately one of my dearest friends and classmates from Music & Art High School days was June LeBell, host of WQXR. June gave me the name of Pavarotti’s agent, Herbert Breslin, asking me not reveal my source. And I wrote a letter explaining what I wanted to do. I received a letter back declining my offer, saying that “Mr. Pavarotti is on a diet and doesn’t want to be associated with food.” This did not stop me. I then wrote a second letter suggesting the probability that Mr. Pavarotti sang under my uncle Tibor Kozma when he was conductor at the Metropolitan Opera in New York City. I went on to explain that it is a tradition for great opera singers to have special dishes named after them, such as Peach Melba, Chicken Cacciatore, Caruso Sauce, and Tetrazzini. I suggested that surely Pavarotti would like to consider the possibility of having this cake named after him. The answer was silence. So I regrouped and decided to present the offer to Placido Domingo, my other favorite tenor. Back to June for a contact and when I called his assistant she immediately said that Mr. Domingo loves chocolate. Then she called me back and said that Mr. Domingo wants to know when he will get to taste the cake! We made a date and I woke up very early that morning so that the cake would be very fresh. I even chose a chocolate brown dress for the presentation. I’ll never forget when I lifted the cover of the cake and Mrs. Domingo inhaled with delight, as the aromas wafted into the air, and exclaimed: “No calories of course”! The telegram is framed and displayed in my baking kitchen. A few weeks later, there was a 1-7/8 pages article in The New York Times featuring The Cake Bible, and written by Corby Kummer. And the final 1/8 page was an article by my longtime friend Brian Miller (who was restaurant reviewer) about Pavarotti sharing a dinner with him, and a photo of Pavarotti raising a glass of wine which, at the time, I read as his salute to Domingo. But after all these years I read the article and discovered that Pavarotti had lost 85 pounds on his diet and was breaking his diet to dine with Brian. I loved how Brian quoted Pavarotti as saying that “there is only one scale he struggles to conquer—the one in his bathroom.” I also enjoyed reading about how much Pavarotti appreciated eating. And I wish I could have known him. Note: The photo of The Domingo shows it with a chocolate leaf embedded into the surface of powdered sugar. I call this my special fossil technique. I wanted to add this wonderful recipe to Rose's Baking Basics but there just wasn't room for one more, so here it is now! Happy first day of Winter! In mid-winter, or any time at all for that matter, when one is longing for fresh peaches for baking, this amazing and easy to make topping using frozen peaches is the answer. Surprisingly, the frozen peaches, when thawed and baked, are firm and juicy. I adapted this technique, created by my wonderful friend Emeril Lagasse, for a Good Morning America on line site. The cake component is my favorite sour cream recipe I use for a fruit upside-down cake because it holds together well, and has a dense but tender crumb. I added almond extract, which is a natural synergy with peach. I also encourage you to try the food processor Almond Upside-Down Cake that is the base cake for sour cherry from Cenk’s Sönmezoy’s marvelous book The Art of Baking Artful Baker. He has generously given me permission to offer it to you. It is incredibly quick and easy to mix but has a perfectly even and tender crumb. 1) Drain the peaches and set them between paper towels to absorb excess liquid. If some of the slices are thicker than the others, slice them in half with a small serrated knife. 3) Arrange the peach slices on top of the sugar, either with the rounded ends facing the sides of the pan or sideways, overlapping slighted as needed to fit them all in. * Twenty minutes or longer before baking, set an oven rack in the lower third of the oven and place the optional baking stone on top. Set the oven at 350˚F/175˚C. 1) Into a small bowl, weigh or measure the egg yolks. Add 30 grams/2 tablespoons of the sour cream, and the almond and vanilla extracts, and whisk lightly until combined. 2) In the bowl of a stand mixer fitted with the flat beater, mix the flour, sugar, baking powder, baking soda, and salt on low speed for 30 seconds. Add the butter and remaining 91 grams of sour cream and mix on low speed until the dry ingredients are moistened. Raise the speed to medium and beat for 1-1/2 minutes. Scrape down the sides of the bowl. 3) Starting on medium-low speed, gradually add the egg mixture in two parts, beating on medium speed for 30 seconds after each addition to incorporate the ingredients and strengthen the structure. Scrape down the sides of the bowl. 4) Drop the batter in large blobs over the peaches and with a small offset spatula, carefully spread it evenly. 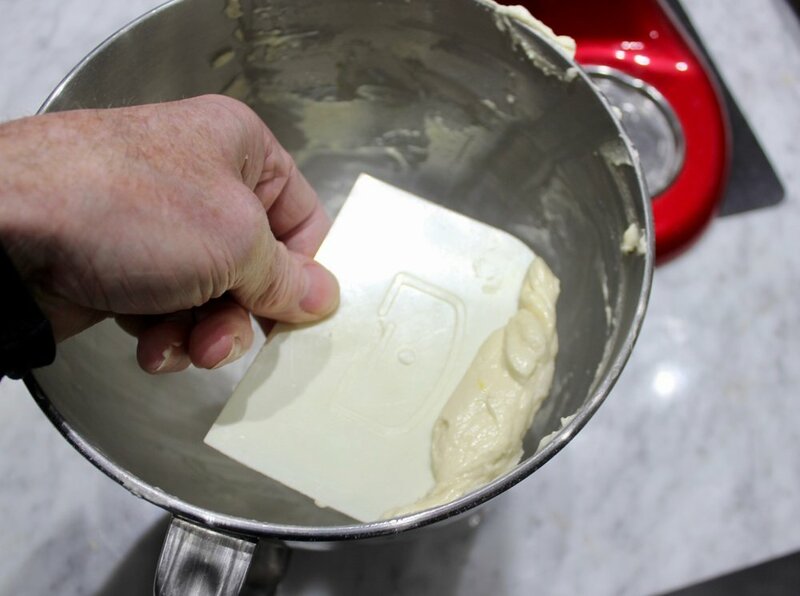 5) Set the cake pan on the baking stone and bake for 45 to 55 minutes or until a tester inserted near the center comes out clean and the cake springs back when pressed. An instant-read thermometer should read about 208°F/98˚C. 6) Let the cake cool in the pan on a wire rack for about 10 minutes. Run a metal spatula between the sides of the pan and the cake, pressing firmly against the pan. Invert the cake onto a serving plate and cool completely. Store Airtight: room temperature, 1 day; refrigerated, 3 days; frozen, 3 months. The baking stone helps to deepen the caramel on the peaches. * Twenty minutes or longer before baking, set an oven rack in the lower third of the oven and place the optional baking stone on top. Set the oven at 325˚F/160˚C. * About 1 hour ahead, cut the butter into large pieces and set it on the counter at room temperature (65˚ to 75˚F/19˚ to 23˚C). Also set the eggs on the counter. 1) In a small bowl, whisk together the eggs and vanilla. 2) In the bowl of a food processor, process the almond flour, flour, sugar, baking powder, and salt until well blended, about 1 minute. 3) Add the butter pieces and pulse until the dough gathers around the blade, about 1 minute. 4) Add the egg mixture and process until blended, about 20 seconds, scraping down the sides of the bowl as needed. The batter will be very thick. 5) Drop the batter in large blobs over the peaches and with a small offset spatula, carefully spread it evenly. 6) Set the cake pan on the baking stone and bake for 55 to 60 minutes or until a tester inserted near the center comes out clean and the cake springs back when pressed. An instant-read thermometer should read about 208°F/98˚C. When I was growing up, I was spoiled by my grandmother who squeezed fresh orange juice for breakfast every single day. Pasteurized orange juice from a container or bottle paled by comparison. I have always loved the flavor of orange, almost as much as lemon which is my top favorite, but never more so than when I started making recipes from Jamie Schler’s new book Orange Appeal. Her book, focusing on many ways both sweet and savory, inspired me to create this cake that is the most orangey cake in my repertoire. Arriving at the precise amount of orange zest to orange oil was a delicate balance. Too much orange oil and it becomes almost petrol in flavor. For us, these amounts work perfectly. You can vary them according to your own tastebuds. * 30 minutes to 1 hour ahead set the butter and eggs on the counter at room temperature (65˚ to 75˚F/19˚ to 23˚C). * With dish washing liquid, wash, rinse, and dry the oranges and zest them (see Notes). 1) Into a 2 cup/500 ml glass measure with a spout, weigh or measure the egg yolks. Add 60 grams/1/4 cup of the sour cream, the orange oil, and vanilla, and whisk lightly until combined. 2) In the bowl of a stand mixer, fitted with the flat beater, add the flour, sugar, baking powder, baking soda, salt, and orange zest and mix on low speed for 30 seconds. 3) Add the butter and the remaining 122 grams of sour cream. Mix on low speed until the dry ingredients are moistened. Raise the speed to medium and beat for 1-1/2 minutes to aerate and develop the cake's structure. The mixture will lighten in color and texture. Scrape down the sides. 4) Starting on low speed, gradually add the egg mixture in 2 parts, beating on medium speed for 30 seconds after each addition to incorporate the ingredients smoothly. 5) Scrape the batter into the prepared pan, and smooth the surface evenly. 6) Bake for 45 to 55 minutes, or until a wooden skewer inserted near the center comes out clean and the cake springs back when pressed. The cake should start to shrink from the sides of the pan only after removal from the oven. Rotate the cake halfway around after the first 40 minutes of baking. Shortly before the cake is finished baking, make the orange syrup. 1) Reduce the orange juice by about 2/3 (see Notes). Then stir in the sugar until dissolved. Add the orange oil. Cover it and set it aside. 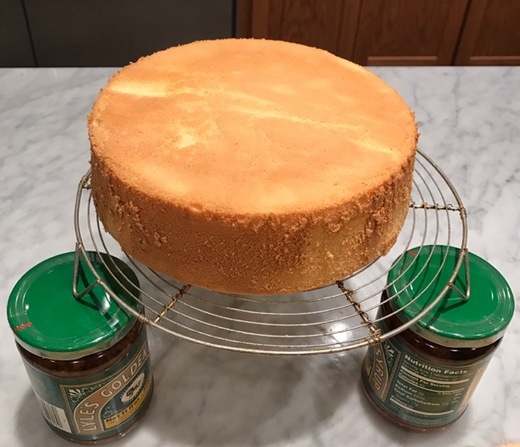 2) As soon as the cake comes out of the oven, place the pan on a rack, poke the cake all over with a wire cake tester, and brush it with about one-third (34 grams/2 tablespoons/30 ml) of the syrup. Cool the cake in the pan for 15 minutes. Invert the cake onto a serving plate. 3) Brush the top and sides of the cake with the remaining syrup. Cover with plastic wrap and cool completely. Store Airtight: room temperature, 3 days; refrigerated, 5 days; frozen, 2 months. * The zest incorporates most evenly into the batter if set on a piece of parchment and allowed to dry for several hours. It then can be frozen for several months. * When Seville oranges are in season the juice gives a more intense orange flavor to the syrup so the orange oil can be omitted. Do not use the Seville orange zest as it is very bitter unless candied in marmalade. Blood orange zest, however is a great alternative. * The best way to reduce the orange juice is to pour it into a 4 cup/1 liter glass measure with a spout that has been lightly coated with nonstick cooking spray. Microwave it on high power, stirring every 30 seconds to prevent air bubbles, which would cause the juice to burst out of the container. This will take about 15 minutes. Alternatively you can reduce the orange juice on the cooktop, stirring constantly. * You can replace the reduced orange juice with an equal amount of frozen orange juice concentrate, thawed. 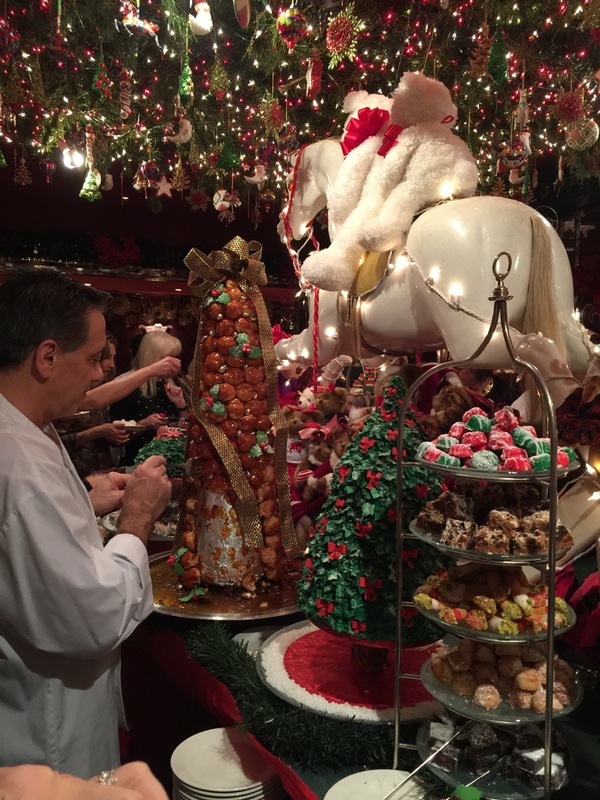 It has become a cherished tradition to go into New York in the month of December to join my dear long-time friend Holly Arnold Kinney, her family, and women friends, for a delightful holiday luncheon at the Doubles Club (hidden within the Sherry Netherland Hotel on Fifth Avenue and 59th Street). Holly owns the Fort Restaurant in the foothills of Denver CO and her husband Jeremy was one of the early members during the construction of the Club. Doubles was opened by Joe Norban in 1976 and continues to be run by his daughter Wendy Carduner. The special Christmas lunch is served by impeccably formal but friendly wait staff but the lavish array of desserts is served buffet style by executive chef Stephen Mellina and his staff. This December, when Holly introduced me to the chef, I was blown away to discover that he already knew me from my books. I was also amazed at how wonderful the desserts were—the croquembouche with hairline crisp cream puffs, the silkiest of chocolate mousses, the raspberry dacquoise, but it was the deceptively simple cranberry lemon pound cake that so intrigued me that I called Mrs. Carduner, who put me in touch with chef Mellina, who then introduced me to the pastry chef Fannie Agri. Inevitably we had a million things in common and couldn’t stop talking. To my astonishment, the cake was my very own favorite Lemon Poppy Seed Pound Cake from The Cake Bible, with dried cranberries replacing the poppy seeds. Of course chef Fannie makes this cake in large quantity so I tried three different variations for a single loaf. The challenge was getting the deliciously zingy cranberries to suspend evenly in the batter without sinking to the bottom. Trial one, I ground the cranberries with the sugar and they dispersed evenly but lost their character. Trial two I soaked the quartered cranberries for 30 minutes, using the soaking water to replace the milk. All the cranberries sank resolutely to the bottom. Trial 3 was the winner. I tried processing the cranberries with some of the flour to help them suspend, but though a few ground up into cranberry dust, most eluded the sharp blades so I ended up chopping them with a chef’s knife. The two test samples with Fannie's original on the buffet table. Woody and I also enjoyed a glorious buffet lunch, complements of chef Mallina. I have found a new home at Doubles thanks to the exquisite ambiance and extraordinarily warm welcome from all. Here’s the recipe just in time for New Year’s Eve! * Thirty minutes or longer before baking, set an oven rack in the lower third of the oven. *Set the oven at 350˚F/175˚C. In a 2 cup or larger glass measure with a spout, lightly whisk together the milk, eggs, and vanilla. In the bowl of a stand mixer, add all but 2 tablespoons of the flour, the sugar, baking powder and salt. With a large chefs knife, chop together the flour and dried cranberries until none of the pieces is larger than 1/4 inch. Attached the flat beater and mix the flour mixture on low speed for 30 seconds. Add the softened butter and half the egg mixture. Start on low speed until all the dry ingredients are moistened. Then raise the speed to medium and beat for 1 minute. Add the remaining egg mixture in two parts, beating for 20 seconds after each addition to incorporate the ingredients and strengthen the structure. Add the chopped cranberries and any remaining loose flour and with a silicone spatula, scrape down the sides of the bowl and stir in the cranberries, reaching to the bottom of the bowl. Scrape the mixture into the loaf pan and bake for 30 minutes. Tent it loosely with aluminum foil and continue baking for 30 to 40 minutes or until a wooden skewer comes out clean with only a few dry crumbs sticking to it. While the cake is baking, prepare the lemon syrup. In a 1 cup glass measure with a spout stir together all the ingredients and microwave for about 40 seconds, stirring once or twice, until the sugar is dissolved. Cover it with plastic wrap and set it aside. When the cake is baked, set the pan on a wire rack and use a wooden skewer to poke holes all over the top. Brush the top of the cake with half the syrup. Allow the cake to cool for 10 minutes and unmold it onto a second rack that has been lightly coated with nonstick cooking spray. Brush all sides and bottom with the remaining syrup. Then reinvert the cake onto a wire rack that is topped with a large piece of plastic wrap. Allow the cake to cool completely. Then wrap it with the plastic wrap and allow it to sit for a minimum of 6 hours preferably overnight. Having fallen in love with Linh Trang's Milk Bread and her beautifully crafted video, I decided to explore some of her other videos and was intrigued by her unique method of making sponge cake without a tube pan. Normally a cake of this type will dip in the center without a center tube to support it. Linh Trang explained how she created this cake to prevent dipping: In Vietnam, people think that is a terrible failure. So a large part of my time in the kitchen was used to find out how to have a soft, cottony sponge cake that has a dome in the end :-) A very helpful tip that I learnt recently is to drop the mold onto the counter from a level of about 7 inches) like what I did in this chiffon video, at 5.33). I am not sure 100% but I guess the shocks help to ventilate and release the steam better, and this trick works like magic to me. 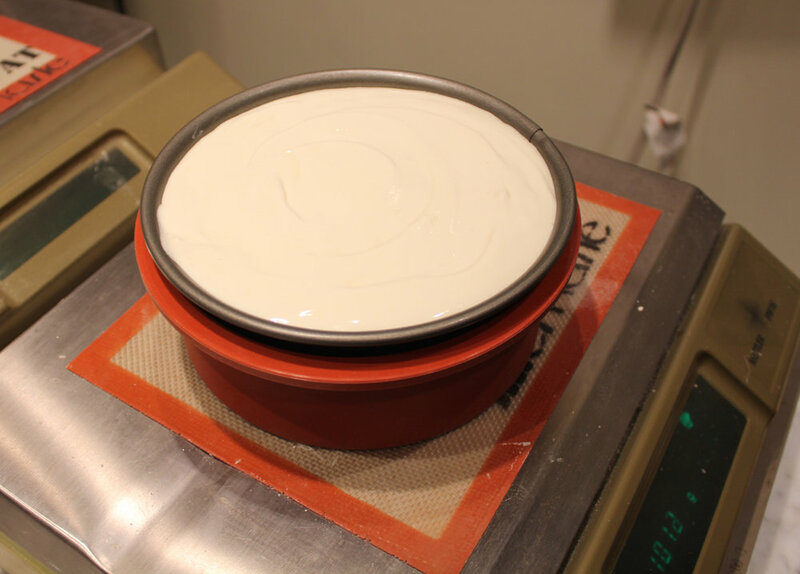 After dropping the mold 3 - 4 times, we can unmold the cake (if it's not baked in a tube pan) and let it cool on a rack. 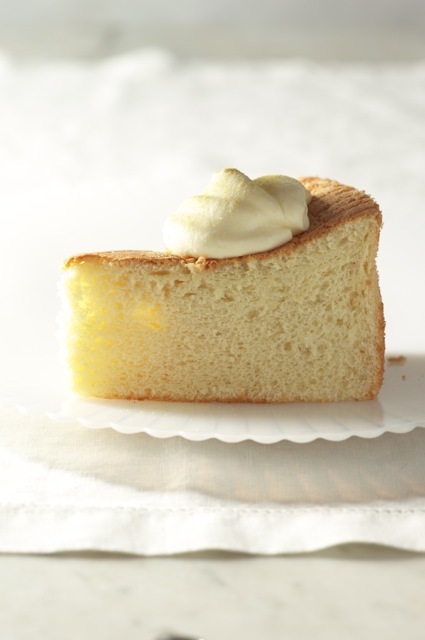 The resulting sponge cake is extraordinarily tender, moist, and velvety and not at all overly sweet. I brought half the cake to my dentist, Dr. Kellen Mori, and learned coincidentally that her 6 year old daughter Olivia had just expressed a yearning for strawberry shortcake for breakfast. 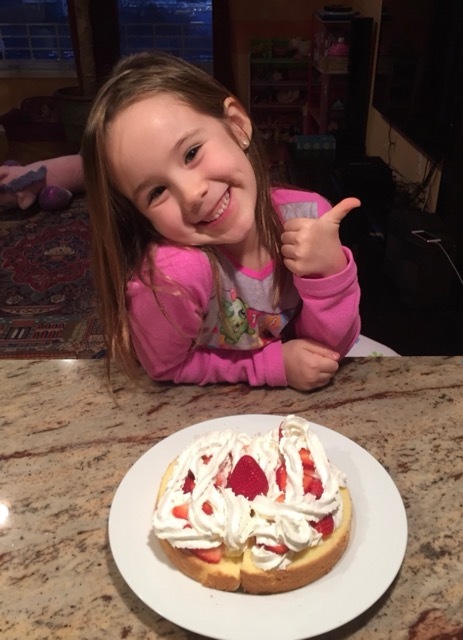 All that was needed was some lightly sweetened whipped cream and strawberries and apparently it was a great success! Olivia even made a video expressing what she thought a "famous baker" should be. Essentially she said that one should not be concerned about fame or money but rather about having fun, and feeding and making people happy. She certainly made me happy! 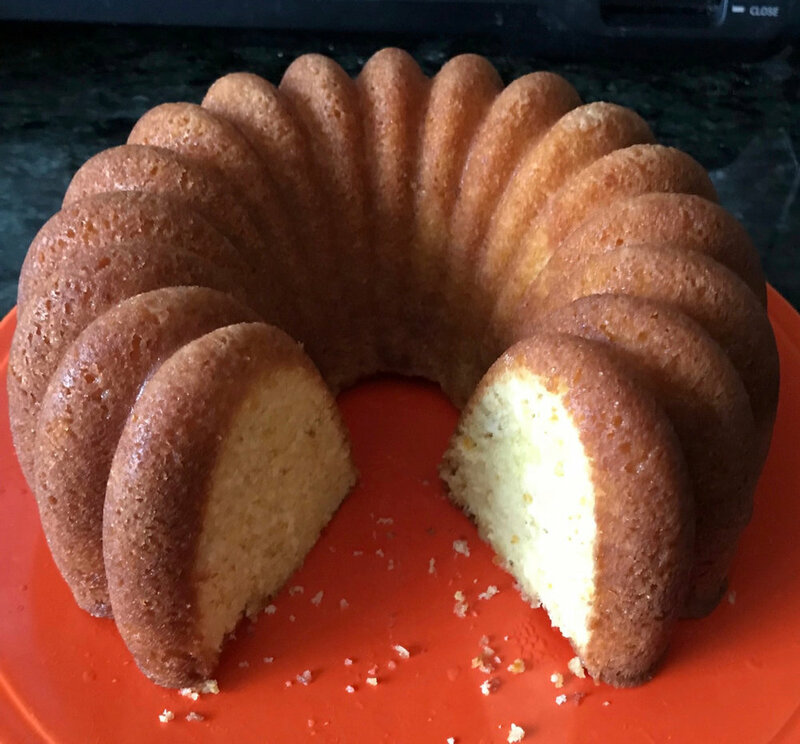 Linh Trang's video demonstrates exactly how to make this cake and she has given me permission to offer the recipe to you. In a medium bowl, whisk together the yolks, sugar, milk, oil, and vanilla until very smooth. Add the flour/cornstarch through a strainer and whisk until evenly incorporated. Beat meringue on low speed until foamy. Gradually add the sugar and continue on high speed until soft peaks. Then lower speed to medium for about 2 minutes until stiff peaks to give it more stability. Whisk 1/3 of the meringue into the yolk mixture. 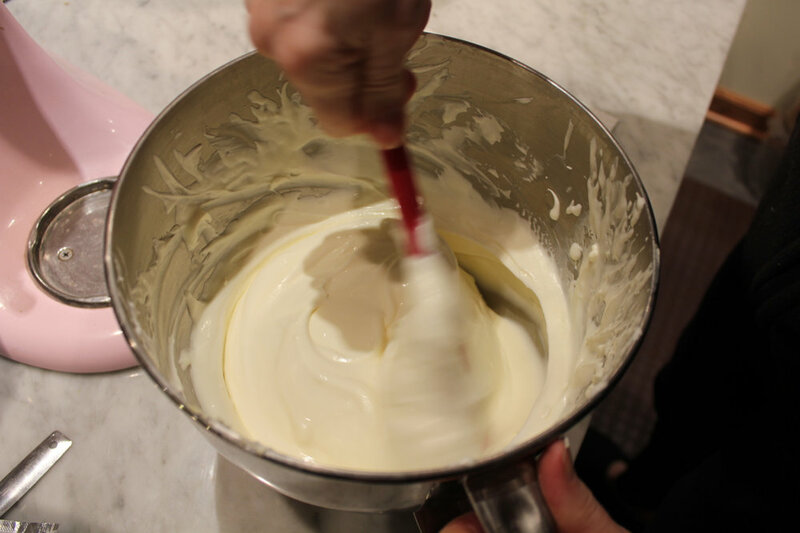 Then use a spatula to fold in the meringue, adding it in two parts. Smooth the surface. Tap the pan 3 times on the counter to release any large air bubbles. Bake toward lower rack so not too close to top heat at 300°F/150˚C 40 to 50 minutes (slow rise=less likelihood of falling) until it springs back. Drop the pan 3 times to release steam and unmold right away. Remove parchment and cool top-side-up on a raised rack. 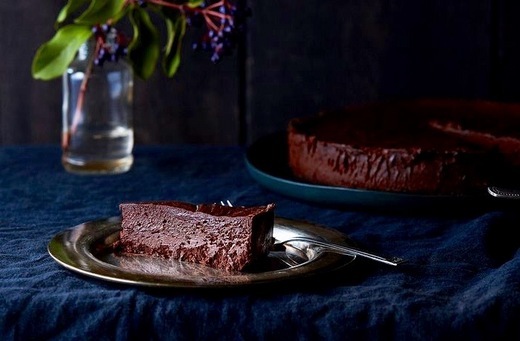 Kristen Miglore, of Food52, has just made live an exceptional and detailed posting on my favorite chocolate cake recipe "The Chocolate Oblivion Truffle Torte," from The Cake Bible. Click here and enjoy! 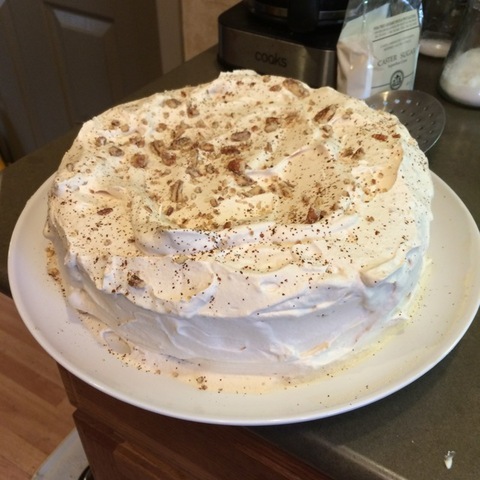 Sean Nutley, owner of the wonderful cookware shop Blue Cashew, in Rhinebeck, New York, made this fabulous version of what was my single layer torte from Rose's Heavenly Cakes--cousin Sybil's Passover Pecan Torte. It has become my new standard and what I will be making for this Passover. (Sadly, Sybil Zashin passed away several months ago. But the memory of this lovely woman remains.) During Passover, tradition dictates that flour must not be eaten. The nuts in this torte replace the flour which not only results in a delicious flavor but is also suitable for the gluten intolerant. 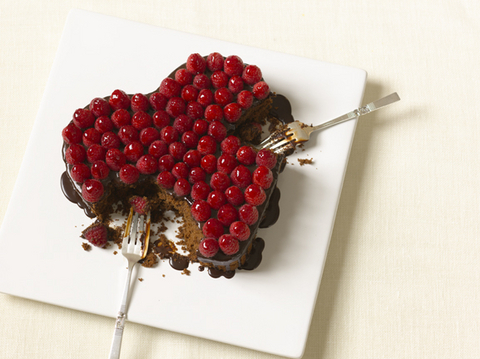 No need to reserve it just for Passover--this torte would serve as a festive dessert for any holiday or special event. Note:: The following posting will be a series of step-by-step photos for another flourless nut torte which uses walnuts instead of pecans and includes chocolate, but the technique is the same. Make this batter twice if planning to make a two layer cake. Special Equipment One 9-1/2 by 2-1/2 to 3-inch springform pan, bottom coated with shortening, topped with a parchment round. Do not coat sides. Preheat the Oven Twenty minutes or longer before baking, set oven racks at the middle level and preheat the oven to 350F/175C. Divide the Sugar In a small bowl, place 1/4 cup of the sugar for the nuts. In another small bowl, place 2 tablespoons of the sugar for the meringue. 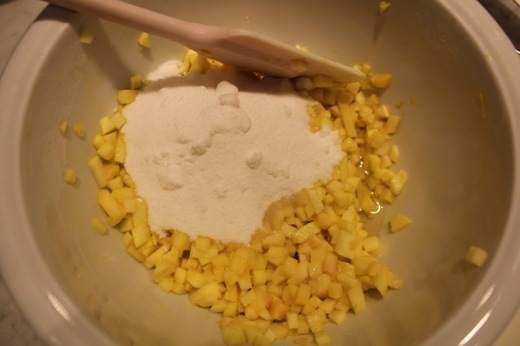 In the bowl of a stand mixer, place the remaining 1/4 cup plus 2 tablespoons sugar. Toast and Grind the Pecans Spread the pecans evenly on a baking sheet and bake for about 7 minutes to enhance their flavor. Stir once or twice to ensure even toasting and avoid overbrowning. Cool completely. In a food Processor, pulse the pecans with the 1/4 cup sugar and espresso powder, if using, in long bursts until very fine. Stop before the pecans start becoming oil or pasty. Empty them into a medium bowl. Make the Yolk Mixture In the bowl of the stand mixer fitted with the whisk beater, add the yolks to the sugar and beat on high speed for 5 minutes, or until very thick and fluffy and when the beater is raised the mixture falls in ribbons. Detach the whisk from the mixer and use it to fold the pecan mixture and the coffee extract, if using,into the batter until evenly mixed. If you don't have a second mixer bowl, scrape this mixture into a large bowl and thoroughly wash, rinse, and dry the mixer bowl and whisk beater to remove any trace of oil. Beat the Egg Whites into a Stiff Meringue In the bowl of the stand mixer fitted with the whisk beater, beat the egg whites (and cream of tartar if using) on medium speed until foamy. Raise the speed to medium-high and beat until soft peaks form when the beater is raised. Gradually beat in the remaining 2 tablespoons of sugar and beat until stiff peaks for when the whisk is raised slowly. If not using cream of tartar, stop beating just before stiff peaks to prevent overbeating The peaks should curve over slightly when the beater is raised. Complete the Batter Add about one-quarter of the meringue to the yolk mixture and, with a large balloon whisk or the whisk beater, fold until completely incorporated.Gently fold in the remaining meringue in three parts. For the last addition, be sure there are no white streaks of meringue in the batter. Pour the batter into the prepared pan and, using a small offset spatula or silicone spatula, spread the surface evenly. The batter will fill the pan half full. Bake the Cake Bake for 30 to 40 minutes, or until the cake is springy to the touch when pressed very lightly in the center. An instant read thermometer will read 185F/85C. In a 2-1/2 inch high pan, the batter will have risen to the top of the pan. Cool and Unmold the Cake Immediately invert the cake onto a wire rack that has been coated lightly with nonstick cooking spray. Leave it undisturbed until the pan feels completely cool to the touch. Reinvert the pan. Run a small metal spatula between the sides of the pan and the cake, pressing firmly against the pan, and remove the sides of the pan. Invert the cake onto a flat plate and remove the pan bottom and parchment. Reinvert it onto a serving plate. There will be a 3/8 depression to fill with coffee cream. Make the Coffee Cream In a mixing bowl, combine the cream, sugar, and espresso powder, if using, and refrigerate for at least 15 minutes. (Chill the mixer's beaters alongside the bowl.) In a 1 cup heatproof glass cup, place the water and gelatin. Allow the mixture to soften for 5 minutes. Set the cup in a pan of simmering water and stir occasionally until the gelatin is dissolved. (This can be done in a microwave, stirring once or twice.) Remove the cup from the water and cool the mixture to room temperature, about 7 minutes. (It can be held longer but should be covered to prevent evaporation.) the gelatin must be liquid but not warm when added to the cream. Whip the cream mixture, starting on low speed, gradually raising the speed to medium-high as it thickens, just until traces of the beater marks begin to show distinctly. Add the gelatin mixture in a steady stream, whipped constantly. Add the vanilla and coffee extract, if not using the espresso powder, and whip just until stiff peaks form when the eater is raised. To avoid the risk of overwhipping, when almost stiff enough, remove the beaters and use them, or a whisk, to finish whipping by hand. Immediately swirl the cream into the depression on top of the cake. If making a second layer fill and frost the entire cake with the whipped cream. If desired, sprinkle with the extra chopped pecans. The cake can be refrigerated overnight and will keep at room temperature for several hours. Note: The gelatin will keep the whipped cream from watering out on standing. The Renée Fleming Golden Chiffon Dédé has written another engaging story about the cake from The Baking Bible which I dedicated to the glorious opera singer Renée Fleming. Click on this link for the story and also the recipe. 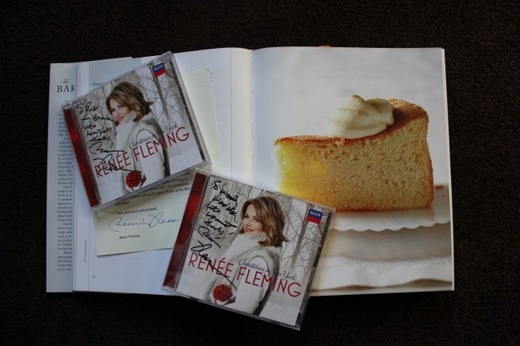 Renée Fleming just sent Woody and me each a disc of her latest release Christmas in New York along with a lovely note. During our stay in August at the Maplestone Inn Bed and Breakfast, near New Paltz, New York, we enjoyed these marvelous muffins made by inn keeper Patte Roche. 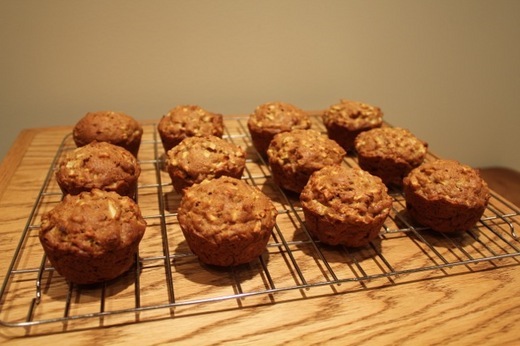 What we loved most about the muffins was the exceptionally large amount of diced apples suspended in them, in fact, there were more apples than batter. 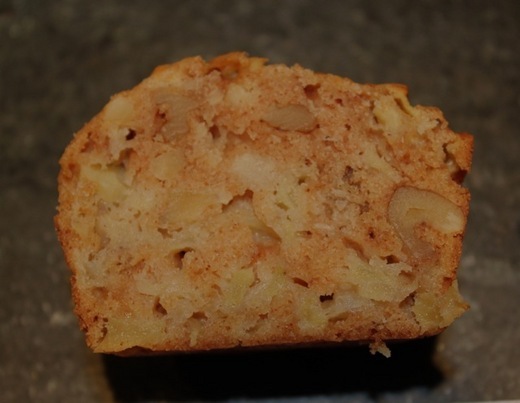 When Patty sent us the recipe, we were surprised to see that the apples supply the liquid in the batter. We adapted the recipe slightly to make 12 instead of the original 10 and we used clarified butter instead of oil as we love the flavor of butter. We clarified the butter to avoid adding extra moisture to the batter as the apples provide just the right amount. If you prefer to use oil, see note below. Preheat the Oven Twenty minutes or more before baking, set an oven rack in the middle of the oven and preheat the oven to 375°F/190°C. Mix the Dry Ingredients In a medium bowl, whisk together the flour, baking soda, salt, cinnamon, and nutmeg. Chop or break the walnuts into medium-coarse pieces and add them to the flour mixture. Whisk to combine. 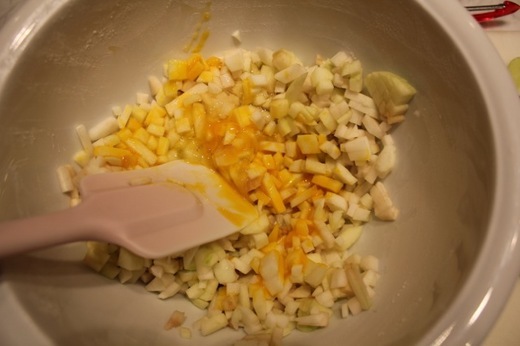 Prepare the Chopped Apples Just before mixing the batter, peel, core, and dice the apples into 1/8 to 1/4 inch pieces. Place them in a large bowl. Make the Batter Add the egg and yolk to the apples. With a silicone spatula, stir and fold them to coat the apples. Add the sugar and clarified butter and stir into the apple and egg mixture. 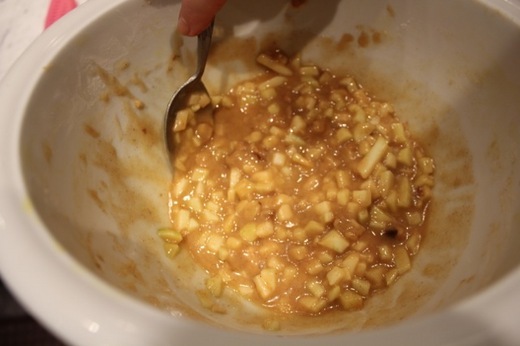 Allow the mixture to sit for 10 minutes so that the apples start exuding a little liquid. Stir in the dry ingredients until well combined. Scrape down the sides of the bowl. The batter will be thick and slightly dry. Use the optional cookie scoop or a large spoon to place the batter (2.6 ounces/75 grams) into each of the prepared muffin cups. 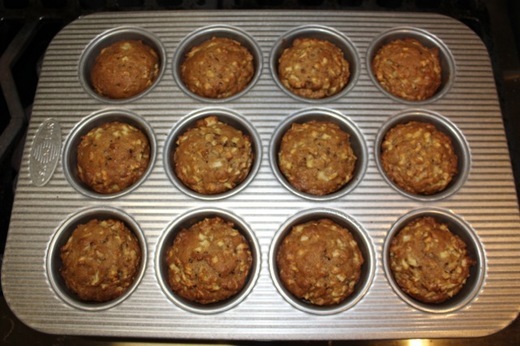 The batter will fill each muffin cup nearly to its top. Cool the Muffins Cool the muffins in the pans on a wire rack for 10 minutes. Invert the muffins onto a wire rack and remove the pan. Gently dislodge any muffins that may have stuck. Reinvert the muffins on the wire rack. Cool completely. Store Room temperature, 1 day; refrigerated, 3 days. Note Canola or safflower can be substituted for the clarified butter. Use 6 tablespoons/89ml/2.8 ounces/81 grams. In the past, I've added melted white chocolate to yellow cake, and also to white cake, with excellent results of higher rise and more moistness. One day it suddenly dawned on me that it could be equally wonderful in a dark chocolate cake. Yes! My dad had a major sweet tooth. He would pile three heaping tablespoons of sugar into his tea and when I expressed shocked indignation, after all his wife, my mother, was a dentist, he would out an out lie that he didn't stir the sugar into the tea! When is a Cupcake a Muffin? I worked for years to create my vision of a perfect blueberry muffin, soft, moist, tender, and bursting with blueberries with only lemon zest to accentuate them and a whisper of nutmeg in the crisp sugar topping. photo credit: Ben Fink For the recipe and interview in the Santa Fe New Mexican click here.